Healthcare organizations are facing complex challenges as the industry transforms under a number of market forces. Adapting to the rise of consumerism, retail competition, tighter staffing markets, uncertain legislation, and value-based payment models keep administrators up at night. Now, more than ever, healthcare organization brand management should be utilized to face these challenges. Your brand represents an idea. It is how people inside and outside your organization perceive it. Your brand is the reason why consumers, who have choices for their healthcare needs, choose your organization. 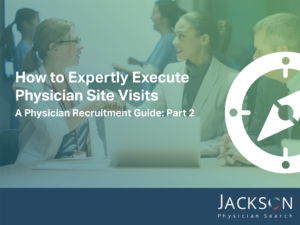 It is also going to help you decide which physician provides the best fit in supporting your organization and helps physician candidates decide if they want to join your organization. Healthcare organization brand management starts with defining your brand. The first step is to identify what sets your organization apart from others in the industry. In a patient-centered world, expectations are higher than ever meaning results must be the center of focus. Pinpoint what your organization can consistently deliver at the highest levels to those who entrust you with their care. Can you provide unique treatments or do you have advanced technologies? What is it about your organization that would motivate someone to choose you for their healthcare services? Your next step is understanding your customer base. In larger urban settings, each health system likely has a clearly defined brand. The system that best understands their audience will ultimately be the most successful. Rural systems may not have put the time and effort into cultivating a brand, but it is no less important. Consumers don’t want to seek medical attention, they go when they have a condition or injury that forces them. From the outside, they will make the generalization that all physicians have expertise. What they will base their decision on is what you have promised through your branding. You have set an expectation about what you are providing and how you are going to deliver it that is different from the others. Convince them that when the time comes, your organization is where they should entrust their care. This same brand logic applies to your hiring decisions. Just as you are “selling” your organization to the consumer, you are recruiting physicians to fulfill that brand vision. 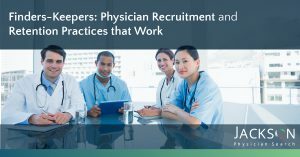 The American Medical Group Association reports that hiring the wrong physician can cost more than $1 million in lost revenue and employee disengagement. A successful healthcare organization brand resonates with physician candidates and demonstrates that they would be working in an environment with a focused vision and shared passion. Another key, that applies both to patients and physician candidates, are the values you promote. Are you cultivating a culture that your employees are engaged with? How does that translate to the patients they serve? It is important that your brand illustrates a compelling vision of your differentiators and how you deliver on everything you promise. Contact us for a personalized consultation on identifying your unique differentiators and seamless solutions for today’s greatest healthcare challenges.